Sasha's latest baby has been seen out of the pouch, so it's time to give a Baby Possum Alert. The box cameras are at this link. Click on a box to get streaming video for that box. Sasha is mostly using box 4 and box 7 If there's a possum in box 1 or 2, it will probably be Tarzan. 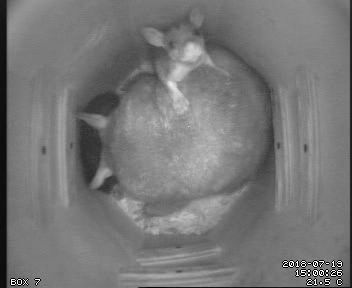 The little one will be out of the pouch more often when it's warmest (currently about 2:00 to 5:00 pm), but it's worth tuning in at any time during the day.